When travelling with pets we need to plan ahead. Gone are the days we can just jump into our vehicle and drive into the sunset. Pets need the right kind of food at regular times. Family picnics are fun so when planning such a thing en route make sure you pack suitable food for your pet. Do not be tempted to share your own food, as the last thing anyone needs are pets with upset stomachs whilst travelling. Your pet needs a supply of fresh drinking water at all times. Pet shops and online stores now supply non-drip water bowls, which can be left in the vehicle. Place an old towel under the bowl for drips from the pet and all will be well. Some pets can have upset stomachs from drinking water from an area they are not used to. Try to carry a good supply of water with you on the journey. An empty lemonade bottle filled with chilled water and kept in a cool bag will last many hours. If you run out of water there is always a supply for pets at most service stations, if not it is easy to purchase bottled water in many retail outlets. Try to plan your journeys and your meal stops. If your pet eats dried food measure out meal sized portions and seal them in polythene bags. They will store easily under a car seat or in the seat well. 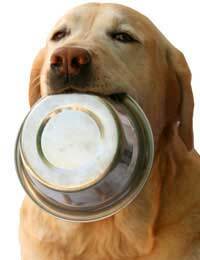 If your pet is used to one large meal try to break this into several smaller meals so it does not travel on a full stomach. For pets that have canned food you can store a few cans and a can opener in your car and bag the mixer biscuit in the same way as the dried food, again, keep portions small. Little and often is best. Allow a little time for your pet to digest his meal and take some exercise to relieve itself before continuing the journey. If you plan to use a different type of food during your travels allow several weeks before the trip to transfer your pet onto the food. Moving them onto a strange diet may affect their stomachs in an adverse way. Some pets only eat raw food purchased fresh and frozen from a butcher’s shop. Check online to see if there are suitable shops where you intend to travel. Whilst on the journey have a cool box with raw meat snacks for your dog. If you pack a bone for the journey ensure it a larger shinbone that the pet will not choke on if he gnaws on it whilst you are driving. Remember to cover the car seat if your pet tends to enjoy his food in the car. Try to have a cool bag for family food and one for the pet. It may be that your journey is disrupted. We have all sat for hours on motorways or been sent on detours due to road works and accidents. It is fine for us to pull into a motorway services and eat a few burgers as once in a while junk food will not do any harm, but what about our pets that have missed their mealtimes? Try to think how your cat or dog can still eat fish or meat. Perhaps this one time you could share fish and chips with them but you eat the chips and let the cat or dog just have the fish from inside the batter. Be prepared to drive off the motorway to a shopping centre where there will be a supply of fresh meat or pet food that can be purchased for your pet. If this is not an option asked in the service station cafes and fast food outlets for raw meat or fish for your pet.